How To Transfer RSS Feeds From One Account To Another? If you are planning to change your FeedBurner username or if you are selling you own blog which is syndicated via FeedBurner, then you have to transfer your feeds to other account. In case you want to change the username, you have to transfer to another account owned by you or else to new blog owner's FeedBurner account to whom to sold your blog. For this you don't have to transfer the full FeedBurner account to a new one. Instead of doing this, you can just pass on the feed ownership. FeedBurner has an option called "Transfer Feed". This feature enables you to transfer RSS feeds from one FeedBurner account to another including the email subscribers for your blog. 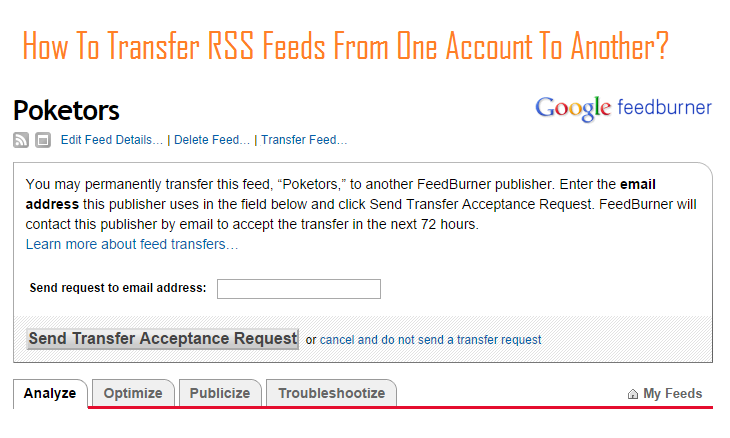 You should remember that you cannot use the Transfer Feeds option to transfer feeds between accounts on FeedBurner.com and Google Accounts or vice versa. You can only transfer feeds between accounts on the same system, i.e., FeedBurner Account to FeedBurner Account or Google Account to Google Account. You have limitations on cross transferring. Sign in to your FeedBurner account. Just click the title of the feed you want to transfer to another account in the My Feeds list, and then click "Transfer Feed..."
Enter the email address of the other account/publisher to whom you wish to transfer this feed once you are prompted to do so. Once done click on Send Transfer Acceptance Request. FeedBurner will be contacting the account holder to whom you just have transferred the feeds by email and provide a link. Then the account holder has to click on the link and sign in to own FeedBurner account and then accept the transfer. The transfer will happen immediately after the process completion. You should keep in mind that the Feed transfer request emails are valid for 72 hours only. The transferee has to accept the request within this time frame else the request will expire and you will have to issue a new request. It may also happen that these emails are found in junk or spam folder. So transferee has to check those folders too. You are done with transferring the feeds.